The small town of Ischgl in the very West of Tyrol has a mere 1,200 residents and nothing shout about in terms of sightseeing - nevertheless, it has an international reputation for being the hippest, wildest, best - add superlative of your choice - skiing town in the Austrian Alps. Ischgl consists of hotels, nightclubs and more hotels, alongside with the odd Hugo-Boss boutique and luxury restaurant. Ischgl also ranks among the towns with most booking arrangements per winter season in all of Austria - a ranking in which one would normally expect only big cities like Vienna or Salzburg. The whole hype about Ischgl is for its supposedly excellent skiing facilities (I don′t ski, I can′t tell). A Tyrolean friend of mine once told me that the town is more or less empty during summers, with silenced cable cars, decomposing Christmas trees and tacky winter decorations in disrepair all over - according to her, the most disgusting town in all of Tyrol. At least during summer. Hotels & more Hotels: Welcome to Ischgl! But what about the winter season? 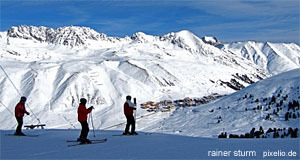 This section of TourMyCountry.com is dedicated to sightseeing, and clearly, Ischgl offers little for such interests. Therefore, I would rather describe my own "Ischgl experience", derived from a visit during the opening party of the skiing season 2007. I think it gives quite an accurate account of what image Ischgl is trying to create. I arrived there by car (other means of transport are less recommendable, although public busses go there) with some friends. It was late afternoon and already dark, the narrow Paznaun valley was covered in snow. In the midst of the whiteness of the mountains and the darkness of the sky, a Las-Vegas-like mirage suddenly popped out of nothing: Lights, lights and more lights that illuminated one monster of a hotel next to the other. The streets were crowded with thousands of people (later that night I should learn through a Red Cross aid that an estimated 25,000 people had come for the opening party). To the right of the main road and at the bottom of the valley, a huge stage was set up altogether with light effects and large screens. Pop-star Rihanna (?) performed a live act with not only seriously bad acoustics at freaking low temperatures, but also with horrible songs. To the back of the stage, the slopes of Ischgl (which has a famous 11 kilometres long slope-course) were brightly illuminated to allow comfortable nocturnal skiing. Continue with "Ischgl - Part II"